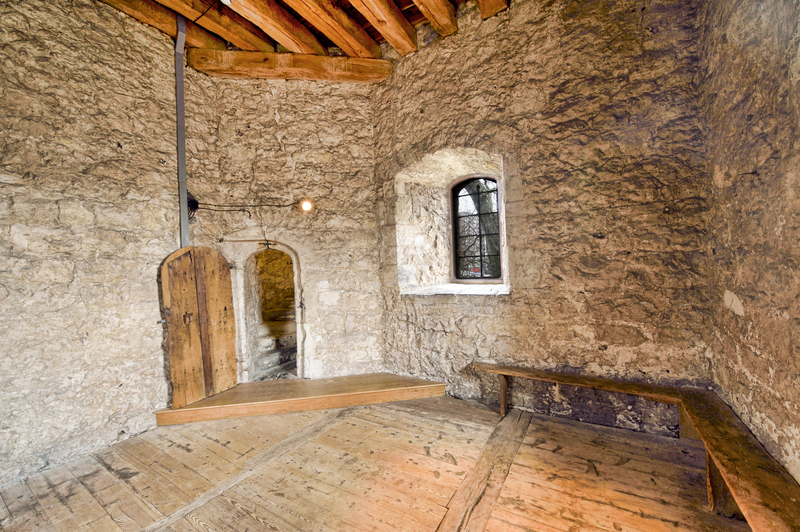 Sarah Freeman introduces us to a medieval gem – a freestanding former bell tower in east London. From the spring 2014 SPAB Magazine. 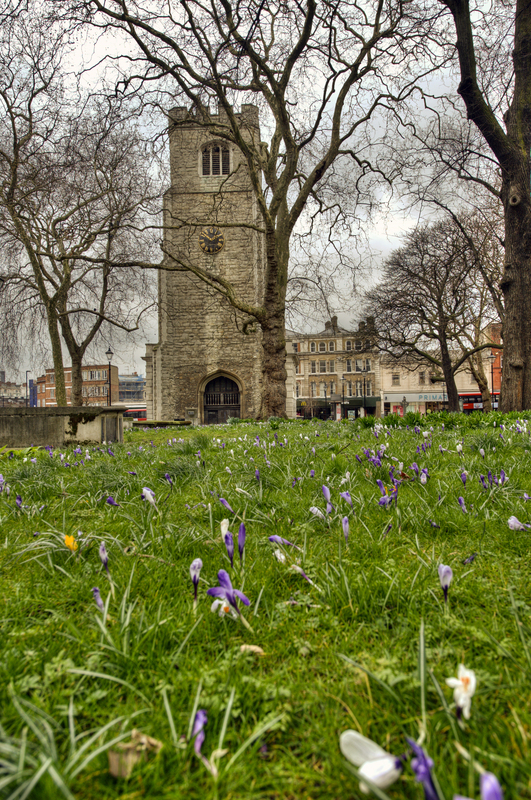 Tucked away in the secluded churchyard of St John at Hackney lies St Augustine’s Tower. This striking Grade I listed medieval former bell tower, located just behind a former Hackney Town Hall (now a betting shop) on the Narroway at the top of Mare Street in Hackney Central, holds the prestigious claim of being Hackney’s oldest building, dating to the late 13th century. Whether sought out or stumbled upon, a visit to the tower is inspiring, due to the significance of its architecture, the story of the fortuitous series of events responsible for its survival as well as the experience of climbing up the spiral staircase. The invigorating ascent up the 135 steps reveals the Tower’s rugged character and is concluded by clambering out on to the open parapet where you are greeted by an unusual panorama of the London skyline. Whatever the weather there is nothing quite like spending an hour on top of this amazing structure, talking to the medley of local and not-so-local visitors. The Tower, constructed of Kentish ragstone with diagonal buttresses, is the only remnant of the former medieval parish church, which once extended to the east of the Tower, covering a large portion of what is now the churchyard of St John at Hackney. Wedge shaped stones in the churchyard show the extent of the former church. Unusually, the Tower gave out on to the south aisle of the medieval church; the remains of a connecting arch can just be seen externally on the east elevation. The likely construction date of the lower portions of the walls is circa 1275, the upper portions being the product of a later reconstruction circa 1520 carried out by Christopher Urswick, a courtier of Henry VII (and a minor character in Shakespeare’s Richard III). In the late 18th century the medieval church was no longer big enough to cater for Hackney’s rapidly increasing population. When it was decided to construct the new parish church of St John at Hackney, designed by the architect James Spiller and built 1791-97, the £10,000 allocated did not stretch to a new bell tower. So when the medieval church was demolished, the Tower remained to serve as an ancillary bell tower to the new church. A bell tower was in fact added to the main church around 1814, but, fortunately for the Tower, Spiller was not confident that it was sufficiently strong to bear the weight of the cast-iron bells. The church’s new tower was strengthened in 1854, after which the bells were relocated. But by this time the Tower had survived long enough for the Victorian sentiment for medieval buildings to be well established, and its long-term preservation was secured. Once inside the Tower, the thickness of the stone walls is apparent, clearly shown by the depth of the window opening with its late Perpendicular tracery. The spiral staircase in the south-east corner leads to a series of rooms laid on top of one another, the first of which now houses a fantastic new permanent exhibition of the history of Hackney, curated by the Hackney Archives and Museum and the Hackney Historic Buildings Trust and largely funded by the Sainsbury Family Trusts. The next room up houses the clock, which has been dated to the late 16th century. It was manually wound for over 400 years until mechanical winding was installed in 2006 to protect the mechanism. The former bell room is on the third floor, where there is a single bell that was installed in 1857, cast by Warner’s Bell Foundry in Cheapside. The bell openings have been restored with stone tracery. ‘It was quite a job to get the Council to find the Tower keys; and a much bigger job to clear the accumulated debris of the countless pigeons who had made the Tower home. We managed to carry out some minor repairs but the Tower was a pretty treacherous visitor attraction at this time – with fenestration open to the elements, unguarded battlements, and very limited lighting. Laurie and the Hackney Historic Buildings Trust oversaw works to the building in 2005-6, enabled by grant funding from the Heritage Lottery Fund, to make the Tower into a safe and welcoming visitor attraction for members of the public. It is also increasingly being sought out by local artists and story-tellers as a venue and exhibition space, and even serves as a particularly entrancing Santa’s Grotto once a year! The Tower is open to the public on the last Sunday of every month and annually during Open House weekend. Please visit the Hackney Historic Building Trust website for details.